Bullfrog Spas is truly a unique hot tub that sets it apart from any other spa. Bullfrog Spas are American made, quality product, that are manufactured with an attention to detail and customer satisfaction. Built in the USA – Does this matter to you? Technology driven – Bullfrog Spas utilizes the latest technology, including robotic devices that build precision. JetPaks – Bullfrog Spas provides you with a personalized, unique spa, suited to your changing interests, preferences, and needs. “Interchangeable, upgradeable, customizable!” Any other hot tub and you are stuck! From the ground up, your Bullfrog Spa is built to last. Bullfrog Spas unique Uni-System is the spa industry’s first 100% wood-free and metal-free support structure. All parts of the Uni-System Structure are made with advanced composites that are injection molded to strict quality standards. The Uni-System does away with the outdated wood and metal structural components still used by other spa brands that can rot, swell, warp, and rust in the humid spa environment. You don’t have to worry about what is going on underneath your spa. Sit back and relax knowing that your spa will last! Bullfrog Spas are the most energy efficient spas in the world! The “EnergySave” design locks heat in the spa with full foam insulation to prevent heat escape. Heat is also recycled in the spa because the JetPak plumbing is submerged in the hot water and heat is transferred form the plumbing to the water instead of being lost into the air. EVERY Bullfrog model meets/exceeds the stringent energy guidelines of the California Energy Commission (CEC). 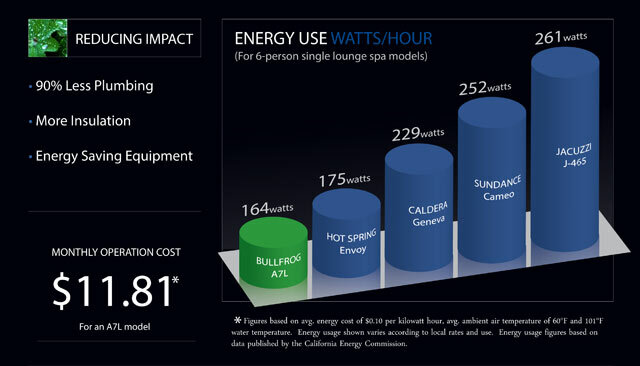 Superior energy efficiency makes Bullfrog Spas the lowest cost to own spa made! You will enjoy the extra money saved each month almost as much as the relaxation your Bullfrog Spa will give you! * Figures based on avg. energy cost of $0.10 per kilowatt hour, avg. ambient air temperature of 60 degrees F & 101 degrees F water temperature. JetPaks create the perfect personalized wellness experience every time you use your spa. Only with JetPaks can you choose the type of massage that best suits you. With other spas, You are stuck with the standard jetting schemes of their spa. Not with Bullfrog, YOU are the boss! Bullfrog makes the ONLY customize-able, interchange-able, & upgrade-able spa in the World! And with 20 plus Jetpaks to choose from, we can create the perfect personal massage for you.